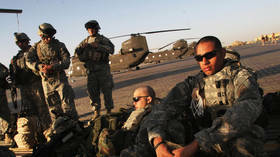 Three US service members and a contractor were killed and three other soldiers injured near Bagram Air Base in Afghanistan in a blast from an improvised explosive device, the US military has said. The wounded servicemen have been evacuated from the location for treatment, the military added. No further details were provided, and it remains unclear what type of explosive device was used. Some media outlets reported the military unit was caught in a blast of a roadside bomb, while other suggested it was actually a vehicle-borne explosive device. Other reports suggested that it was a suicide bombing claimed by the Taliban, with an attacker driving an explosive-laden car into a US military convoy. Last month, two US service members were killed in Afghanistan during a military raid. The violence continues in the country despite the US and the Taliban holding several rounds of peace talks since late last year, with the latest one ending earlier this month. So far, the sides have not reached any agreement, yet both cited “progress” in the negotiations.